Ryan Preece isn’t a new name when it comes to the NASCAR XFINITY Series. Preece ran full-time last season with the underfunded JD Motorsports, but opted to not return with them this season because he wanted to be in equipment he knew he could win in. While Preece has spent a majority of the season running modifies and late models he recently made a return to the NXS with Joe Gibbs Racing using his sponsorship money to be able to run two races with the top-notch team. The 26-year-old knew it was risky to use his money like that but confidence was key. 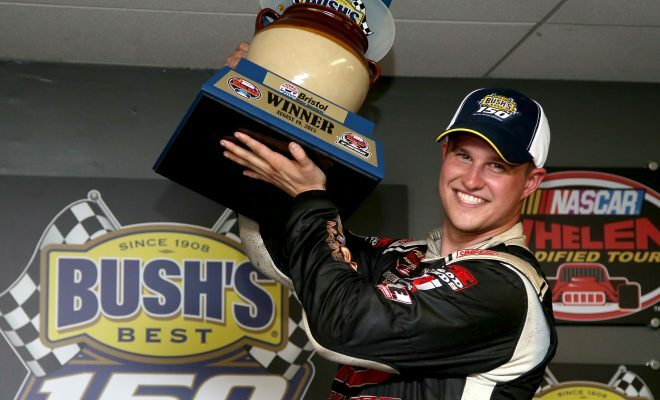 He made his debut with for JGR at New Hampshire Motor Speedway in the Overton’s 200 where he ultimately finished second behind teammate Kyle Busch who would score his 89th win in the NXS. Busch may have won that race, but it was Preece who turned heads and stole the show. Preece would go on to steal the show at Iowa Speedway as well. As soon as the race weekend started it was Preece who had the car to beat. He won the pole for last Saturday’s US Cellular 250 presented by American Ethanol and would go on to hold off a charging Kyle Benjamin and Brian Scott in a green-white checkered finish to win his first career NXS race. “I knew what I felt like I had to do to get attention, to make noise, and I felt like these two races were my shot,” Preece said. Preece deserves a chance to run with JGR again and while many races for the remainder of the season have driver and sponsorship fulfilled it’s obviously he’s shown Coach Gibbs and the whole organization what he can do given the equipment. Statistics speak for themselves and Preece has an average finish of 1.5. While another opportunity to run a JGR car may not open up for the rest of this season, Preece has certainly shown other teams what he can do as well. From past decisions, I can’t see Preece signing on or racing for just anyone. He wants to win, and has proven he can do so. 2018 may be the year we see Preece in a JGR car more often, and here is why I think it’ll happen. NASCAR announced yesterday that it would further limit the number of races MENCS drivers with more than 5 years of experience can run next season. The magic number is 7. Kyle Busch said earlier this year he would stop racing in the NXS when he won 100 races, he is currently at 89. If Busch doesn’t win any more races in the series this season, which is highly unlikely but if he doesn’t and races the full 7 races allowed next season he will still only make it to number 96. My point here is if Busch only runs 7 races next season in the series it could certainly open up opportunities for Preece. Erik Jones is certain to run NXS races for Gibbs as well, but he won’t be running the full season either as he will want to run for a MENCS Championship ahead of an XFINITY Championship. The organization also has driver Matt Tift in a car but Preece can’t be ruled out as a top choice with NASCAR changing the rules yet again for experienced Cup drivers. If sponsorship is there I can almost guarantee we see Preece in a JGR car in the NXS next season. He has proven he belongs in the series and is already bringing quite the fan base with him. It’s a feel-good story of someone who never gave up but was patient. It would be great to see the kid be able to contend for a championship.